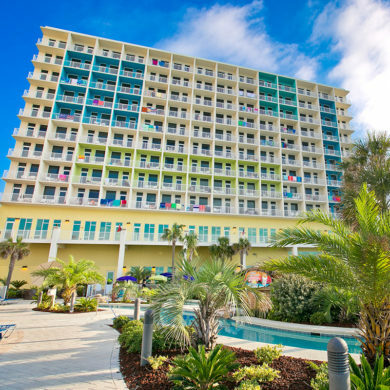 Our Pensacola Beach Hotel is Where You’ll Want to Stay. The Holiday Inn Resort Pensacola Beach hotel will make you feel happy from the moment you set your flip-flopped foot inside our door. We’re here for you and yours, offering the amenities you need to plan the perfect vacation – or host the best business meeting. 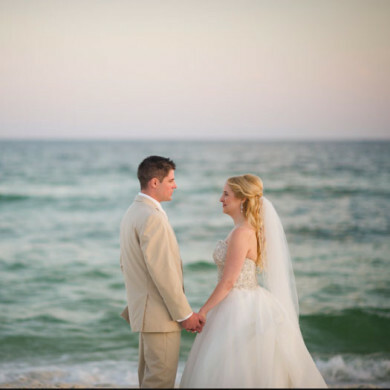 From your private balcony or the terrace of our ample 10,000 square foot event space, take in dazzling views of the sparkling waters and shimmering sands of Pensacola Beach – recently named No. 5 of all U.S. beaches by TripAdvisor. Its natural beauty is offset by our bright, modern lobby and stylish, comfortable guest rooms – including colorful Kids’ Suites designed with your family in mind. We’re all about fun here at the Holiday Inn Resort Pensacola Beach hotel, and you’ll feel it from the front desk to the pool deck. Our pool is the best on the beach, with cascading waterfalls and a 250-foot seasonally heated Lazy River. 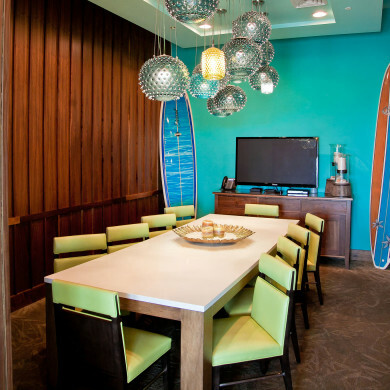 There’s no reason to leave the resort, with Riptides Sports Grill and Beachfront Tiki Bar serving up delicious dining and crafty cocktails seven days a week. If you do decide to get out, we’re within walking distance of the beach’s best restaurants, nightlife and activities including charter fishing, paddle boarding, sailing, kayaking and biking. We’re also a quick drive to regional attractions such as the National Naval Aviation Museum, Fort Pickens, Gulf Islands National Seashore, Historic Downtown Pensacola, Pensacola Lighthouse, Blue Wahoos Baseball Stadium, Veterans Memorial Park and the Saenger Theatre. No matter what you like to do, we can point you in the right direction. Read our reviews here for even more of an idea of the fun you’re about to experience. When you start your day with a smile on your face, there’s no telling where it might take you. Romance your sweetheart at the beach this Valentine's Day! Package includes breakfast in bed for 2, chocolates, champagne & leisurely late check out. Get the vacation you've been dreaming about without breaking the bank with our Book Early and Save Pensacola Beach hotel package. Breakfast is on us! Gas up on us! Book now and get a $25 fuel card at check out. Holiday Inn Resort is located on the beach with lazy river, kids suites, pirates and more.